With recent advances in lighting technology, many of our customers are choosing to replace outdated fixtures with Light Emitting Diodes, commonly referred to as LED lighting. 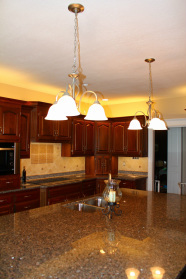 LED lights offer many advantages over conventional lighting. Most LED lights have an operational life expectation of approximately 50,000 hours. If you use the light 4 hours a day, you could expect it to last almost 35 years. As LED lights rarely require replacement, they are considered practically maintenance free. LED lights are perfect for those difficult to reach locations. No more getting out a ladder to replace a light bulb every year or two in the chandelier in your 18-foot ceiling! While slightly more expensive at initial purchase, LED lighting pays for itself through it's energy efficiency. LED lights have an estimated 80-90% energy efficiency when compared to traditional light bulbs, reducing your home's overall power usage. LED lights are also rugged and durable. Because LED lights are so sturdy, they may be used either indoors or outdoors. LED lights are not effected by exposure to wet, hot or cold weather. LED lights offer design flexibility and are a perfect way to achieve most lighting effects. LED lights come in bulbs and rigid or flexible strips which are small enough to fit in locations never dreamed of until recently. LED strip lighting has become our most requested lighting for both above and under counter lighting. Simple retro kits are available to change your existing recessed incandescent lighting into energy efficient, maintenance-free, attractive LED lighting. LED lights brighten up immediately when turned on. Unlike some lighting, LED lights do not need additional time to achieve full brightness levels and produce a very natural looking light. Has another electrician told you it can't be done? It can't be done until CWC Electric, LLC tells you it can't be done!